Olivia Cleans Green: What did you do during Hurricane Sandy? Thankfully, Hurricane Sandy has turned out to just be a terribly rainy and windy day here in Providence, at least on my block. We haven't lost energy or internet access. Instead, my boyfriend and I have gained a long weekend. Today has been a day for doing everything really slowly and with pleasure and joy. I ate two breakfasts which I balanced out by doing two loads of laundry. (That's how it works, right?) I watched Amy Sedaris craft newspaper wigs with Clinton Kelly on The Chew. I took a superlong superhot afternoon shower just in case we ran out of hot water at some point. Of course, I also watched Mad Men and gorged on all things #Sandy on Instagram and Twitter. 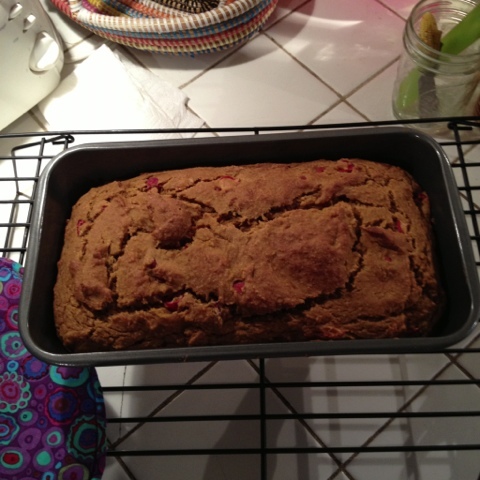 My boyfriend Richard and I also made pumpkin-cranberry bread using produce from our CSA this late afternoon. It was my first time cooking with a real pumpkin! We veganized a recipe from the Joy of Baking. We used more baking powder and soda instead of eggs, 2 T canola oil in place of butter, and lots more pumpkin and maple syrup instead of sugar for general yumminess! It was delicious. I only wish we had nuts to balance out the moistness. Oh well, maybe next time we'll have the forethought to roast the pumpkin seeds. The best thing about today was Richard played Connect Four with me. I haven't played it in a years. It's my favorite game since childhood, but I am pretty sure he hates it. He's such a good sport! What did you do during Hurricane Sandy? I hope you were safe and warm! Sending lots of extra love to all my friends in NYC <3. Things look pretty bad there. Olivia, you are my personal hero! Thanks for knowing how to live! Thanks! You are pretty pumpkin-ey awesome yourself!